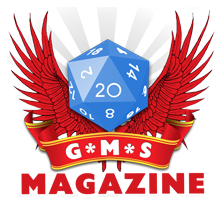 The G*M*S Magazine Podcast Episode 58–Story Realms! Welcome back, once again, to the G*M*S Magazine podcast! Once again, this is a weird episode. Yep! Another one! It is weird because I have done a couple of things differently. For starters I am (again!) on my own because I didn’t have time to arrange anything with Dr Mike. Naturally that means the podcast is lacking in common sense and beauty, but I am the funny one, so it still works out OK.
Also the interview is a bit different. We had some sound issues while recording, the audio just disappeared and, although I’ve tried to iron out the rough edges, some gaps still remain. As technology always does, it sorted out itself, but when we had finished the interview and we were chatting. For that reason, and because my interviewees are proper incredible and amazing (trust me… they are), I have left the post-interview conversation. Hopefully this will also give you an insight as to how amazing it is to be a podcaster and get to meet people like this. OK, sorry… The interview is all about Story Realms, a story telling boardgame that looks just amazing and I am sure will play just as good. I was so seriously taken by it I was the first backer. A feat that it’s unlikely to be repeated again (until they releases the expansions for this game, of course). And this episode also has a very special dedicatory. Remember, get hold of me on podcast@gmsmagazine.com and let me know what you think! NextGale Force Nine, LLC in partnership with STARZ Entertainment announces the release of the board game Spartacus: A Game of Blood and Treachery. Podcast Episode – The RPG Room: Why play, hey?